It is autumn in Sarajevo, and the leaves of the trees by the river that flows through the city are turning golden, carpeting the long, scenic riverside path leading to the old town. The river is dammed to protect the city from flooding, and its walls are made of concrete to protect the banks from eroding, but the ducks do not seem to care about urban improvements, as they frolic and fish as if they were living in a pure rural paradise. The pomegranate trees are overflowing with ripe fruit. On quite a few street corners you can buy fresh squeezed pomegranate juice. You can buy it in a plastic cup or in a small glass bottle that you can take with you and sip slowly. I NEVER pass by a stand selling fresh squeezed pomegranate juice. The juice is rich, red, velvety and full of iron, minerals and vitamins. The walk from our hotel to the old town was very pleasant. People were bundled up in coats, but the sky was clear and I felt grateful that it did not rain. When we reached the old town, I felt charmed by its beauty. The long Balkans war from 1991 to 1995 has scarred the city and its people, but the Spirit is resilient and it has healed the city. On our walks, I saw less bombed and scarred buildings, and much more beautiful architecture. There were beautiful mosques with round copper roofs and tall minarets, stone churches, and Ottoman-era markets with arched doorways that have thrived here for hundreds of years. The old town is vibrant and lively, not just with tourists but with many locals. There are lots of places to eat, shop and drink. Generally, the food looked very fresh and good. Perhaps the fact that there are so many choices encourages places to compete for quality and for customers. There are streets lined with copper-ware shops, where you can see how they hammer copper and shape it into plates, tea and coffee pots, jewelry, spoons, trays and much more. There are shops selling jewelry, clothing, bags, scarves and all sorts of souvenirs. Some are imported from India, and some from China, but some were locally made. There are lots of small cafes in which you can sit and drink Bosnian coffee or tea, served on trays with a small copper pot and an ornate glass. Bosnian coffee is exactly like Turkish coffee, which is boiled twice with whole cardamom seeds until it foams, and is served with sugar cubes on the side. By this time in our trip, I am all caffeinated out, so I no longer drink coffee. After a sleepless night in Montenegro in which I realized that I was overstimulated from caffeine, I stopped drinking cappuccinos and all other kinds of coffee, so regretfully I had to let this Turkish coffee treat remain untasted. I know exactly how it tastes from memory, since I drank hundreds of cups of Turkish coffee in my twenties, while living in Israel, which was once occupied by the Ottoman Empire. I did drink Bosnian tea which, like Moroccan tea, is made from loose leaf green tea served with leaves of fresh mint in a pot, with crystal sugar on the side. There are many shops selling Bosnian sweets. The sweets are made from different kinds of Lokum, which is cornstarch mixed with rose water or with milk, plus all sorts of flavors, to give it different textures and tastes. The Lokum is later rolled and covered in different toppings like pistachios, rose petals, saffron, cocoa powder and more. Lokum sweets were invented by the Ancient Greeks, and have migrated all the way from Armenia to Iran, spreading all around the Arab world and on to every territory of the Ottoman Empire and the Balkans. These sweets are known as Turkish Delights, and I have had them many times in my life, but these were better than anything I have tried before. We bought them fresh, not packaged, from a small bakery which makes nothing else. Perhaps this was the key to their delicate flavor. I can pass up all the different kinds of Baklava that are sold everywhere in the city, mostly because I find them too sweet and too oily. A piece once a year is plenty for me. But I did not pass up the freshly made Halva. If they only made these sesame paste treats from honey instead of sugar, well, they would almost be health food…. I know, I know, I said almost…. As it is, the Halva contains nothing but grounded sesame seeds and sugar, and sometimes it is embedded with pistachios. In a small Buregdzinica, we ate a Bosnian Burek made the traditional way. A Buregdzinica is a place that bakes and serves Bosnian Burek. This Burek which is also known here as Pita or Pite, is a pastry stuffed with white cheese, spinach, potato or meat. It is rolled out like a sausage and then it is laid into a large round metal pan in a spiral, from the center outwards until it fills the pan. Instead of being baked in an oven, the metal pan is covered with a conical shaped cover that is then covered in hot coals. The burning coals cook the Burek and the top is then lifted up by a pulley. We tried the Burek filled with pumpkin, which was a rare autumn treat that was light and delicious. Sarajevo’s charm lies in its laid-back atmosphere, thriving art scene, festivals and a fascinating mix of Ottoman, Austro-Hungarian, Slavic, Muslim, Orthodox, Catholic and Jewish cultures. We visited the old synagogue which is today a Jewish museum. We learnt so much about the lives of the Jewish people in Bosnia and Herzegovina. 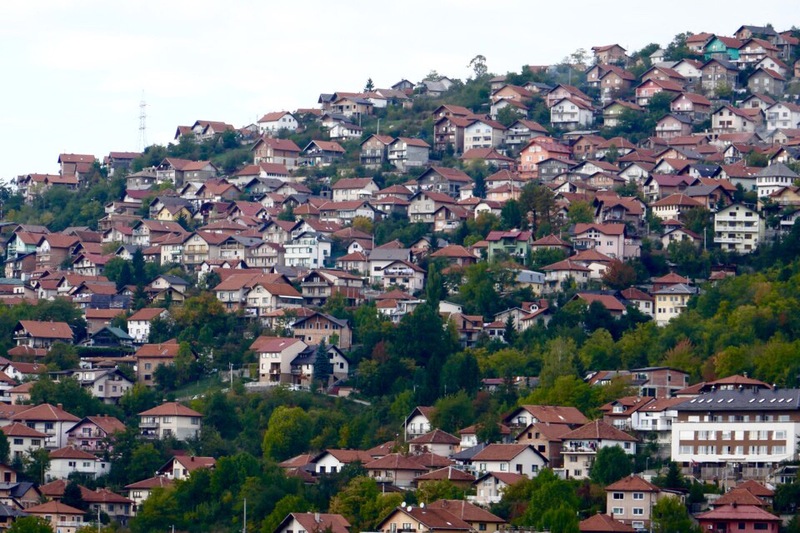 The Jewish people in Bosnia did not suffer discrimination or harassment. They initially lived among the Islamic community and Jewish women intermarried with Muslim men. In a documentary we saw at the museum, one woman said that they didn’t consider these interracial marriages of Jews and Muslims progressive or open minded, but just normal and natural. They thought after all, why not? Interracial married couples lived in harmony with their neighbors. One woman said that the Jewish women in the community used to come to her house for company, advice and healing remedies, while her Muslim neighbors did the same. They came to her house asking for company, advice and to exchange recipes for special dishes for the holidays. It sounds almost idyllic and my heart was warmed by hearing this. This is how it should be…. When WW2 started, Muslim families helped hide Jews in Bosnia. They risked their own lives and the lives of their children to help their neighbors. They hid the Jewish Bibles and the beautifully illustrated Hagada (the Passover holy book) belonging to the jews that were taken to the ghettos, to keep them from being burnt by the Nazis. They later returned the holy books to the descendants of the Jewish families. We saw a copy of the oldest Hagada still in existence at the lovely stone museum. When the war in 1991 started, the Jewish community in Sarajevo mobilized into action. They converted the old large synagogue into a shelter, and provided housing for all those who lost their homes as a result of the bombing. They provided meals around the clock and did all they could to help their neighbors. From there, we visited the Culture Center of The Republic Of Iran. We were drawn to enter by beautiful paintings that they displayed of angelic women figures dancing in the air. We had a lovely chat with the Bosnian Iranian woman who attended the center, about traveling in Iran. We said that we would love to see this ancient and fascinating part of our world, so full of rich culture, food and art, but that we are not sure it is safe yet. She assured us that the people of Iran are warm and hospitable. They are warm-hearted, and they love tourists. She said they will invite us into their homes and do all they can to make us feel comfortable and safe. She said that on her recent trip to Iran, she walked alone at night and felt no fear nor sensed any danger. She said people were SO happy to see tourists, feeling so isolated by all the decades of political upheaval and trouble. Jules was excited to hear this, but as a woman who does not wish to wear head covering, I am still unsure. I also prefer to travel without looking back over my shoulder and being concerned for our safety. We left wishing her well and truly hoping that we would be able to travel to Iran during our lifetime. The memory of the recent war is all over Sarajevo. The landscape is dotted with white graves. All of them honor people who died very young, during the same years of 1993-1995. The fields of white stone graves stretch in all directions. Back in the old city, we saw old ladies selling wool socks or lace. We saw small children and maimed people begging. We saw pickpockets, tourists from all over the Arab world and business people from Europe. We saw lots of people doing kind things towards others. There are large malls in the city in which the locals shop, eat, drink and smoke. Oh, so many people smoke in this country! They even allow smoking inside all the Bosnian malls, and when remaining inside for more than a few minutes, it becomes very hard to breathe. I soon found myself coughing, and by the end of the day, my clothes and my hair smelled of second hand smoke. How can so many people care so little about their health….. They go into the churches and pray for healing miracles, but they do so little themselves to live a ‘life affirming’ lifestyle. They drink alcohol daily, smoke, eat heavy and too much food and some do drugs. In other words, they do all they can to harm their bodies, and later they pray for healing…. We also saw some healthy eating places making chia seed desserts, healthy juices and fresh salads, many organic shops and people who do not drink or smoke. I was touched by how truly integrated this city is and historically has been. I saw many woman friends link arms or sit in cafes, one in a Muslim outfit and the other in a mini dress with flowing hair. They TRULY do not try to convert one another or focus on their differences. It is as if those things simply do not matter. Tomorrow we are leaving Sarajevo and crossing the border back to Croatia. I was pleasantly surprised by this lovely city and maybe by the next time we return, there will be no smoking indoors at any of the malls and the banks, and less people will be smoking and more affirming the beauty of life….